Discussion in 'Gardening' started by Crowan, May 22, 2017. I truly understand about the birds. My husband all states with a smile I feed the birds more than I do myself. I adore flowers an plants that produce seeds for them. Good luck on the grass. One of my friends commented on how her husband was running around chasing birds from his lawn earlier this year because he'd put down grass seeds. A good crop of apples. I wished I could post photos for you to see my produce. But I am loving your tomatoes! Wow. Apples are divine. My apples this year has been so so. Sad! Your photos are so professional looking too..great job. 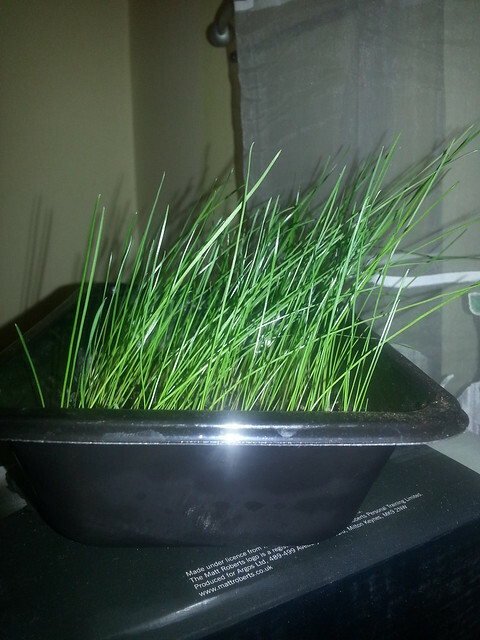 Yeah, clipping that shorter indoors makes your house smell like fresh grass. Yuck. I don't like the smell, either. How long until you have the perfect lawn? My parrot loves to eat my fresh sprouts...he would love to taste this. Ah, we have a problem here. The rest of the lawn is poor to average. I'm trying to fill in the patches. Where there were patches, the new grass is lush and green, so it's far from perfect. The only real way to sort a lawn out properly is to turn over the lawn and resow the grass all over but that costs too much for me. Lawns seem too much bother to me. We are gradually replacing our grass with gravel and flower beds. We are the same as Crown about grass. Our farm has too much grass we cut the grass endlessly. Around the house we ground flowers, garden and herb beds and etc. some tasty fruit trees. Well, here we are at the start of a new season. This cold - hot - cold - hot weather is difficult. Sweet peas are ready to go out (sown in January) but I'm not convinced they'll survive! Omg...so true. This year has been insane. My garden is confused..
You're in New York, aren't you? Even more chaotic, weather wise, than here, I believe. From what I've been reading - and of course forecasting has never been an exact science and is getting harder - both N America and Europe are locked into this hot/cold cycle for a while. At least we're not in India - the temperatures there are crazy. And yet more fires in Oklahoma. Yes we live in New York. But we purchased a house in the cotwalds near Broadway U.K. My family primarily resided in Austria the country of my parents birth. Yes, thank goodness we are not in India. How did your sages do this winter?